Lately, I’ve been obsessed with matte foundations. They’re my favorite in the summer to keep my face oil free. With matte foundations I feel like I never have to reapply during the day. 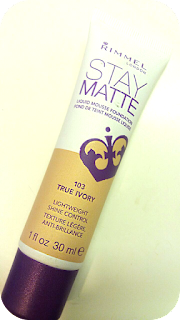 Recently, I purchased the Rimmel London Stay Matte Liquid Mousse Foundation at Target mainly because it was cheap. I paid $4.99 for 1 oz, score! I never tried this foundation before and honestly, heard nothing about it either. Being a foundation junkie though, I had to try it out. This foundation is a liquid mousse foundation, which is something I’ve never used before. It also comes in a squeeze tube, which is also something I was unfamiliar with. When I squeezed some product out onto the back of my hand, I was a little scared, it was so thick! Using my fingers to apply, I started blending it out onto my face and thankfully the product started to thin out, but it still gave full coverage. Although the foundation appears super thick when first squeezed out of the tube, it thins out and blends very easily onto the skin. It didn’t feel super thick or cakey on my face either. It felt honestly, quite perfect. This foundation is a full coverage foundation and doesn’t really need any building up. This foundation is also 100% matte. Sometimes you get a “matte” foundation that isn’t really matte at all, but this one delivers. It also matched my skin tone perfectly and didn’t oxidize at all. I was able to apply a setting powder on top as well, without my skin looking cakey, which happens sometimes with matte foundations. One of the most important things a foundation needs to do for me is last all day. My skin gets a little oily in the summer and if I don’t have to blot my face and reapply my foundation halfway through the day, I’m happy. This foundation lasted all day for me, no reapplying needed! After using it for a few weeks now, The Rimmel London Stay Matte Liquid Mousse Foundation is probably one of my favorite foundations ever! It’s the perfect matte foundation and the price is incredible. I think this foundation is so underrated. I never hear anyone talking about it, and that’s a real shame, because it’s so amazing. Thanks for reading this review on the Rimmel London Stay Matte Liquid Mousse Foundation! Below you will find my official review system, and the final score for this product. Have you tried this foundation? Let me know what you think of it in the comments! Also, let me know what beauty products you think are underrated! Follow me on Twitter and Bloglovin’ to get updated on when I post next.